EEG stands for electroencephalogram, a test commonly used to detect electrical activity in the brain. Detecting, recording, and interpreting “brain waves” began in the late 1800s with the discovery and exploration of electrical patterns in the brains of mammals, and the technology has evolved to enable applications ranging from the medical detection of neurological disorders to playing games controlled entirely by the mind. To fully understand how EEG works, you must first understand how the human body conveys information between cells using electricity. Here’s a simplified explanation of how cells communicate: when the electrical charge in an atom is unbalanced, the atom becomes either positively or negatively charged and allows electrons to flow from one atom to another to maintain equilibrium. This flow of electrons is what we all refer to as electricity. With about seven billion billion billion atoms in each human body, we have the capacity to generate significant and measurable amounts of electricity. These electrical signals (or “impulses”) from atom to atom are what enable human cells to communicate with each other. 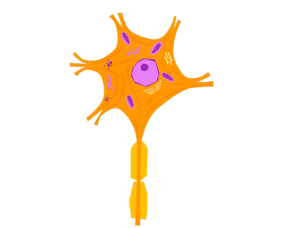 Our nervous system conducts these impulses, allowing them to jump from cell to cell until they reach their intended destination. There are varying speeds of impulse transmission—the fastest impulses can travel at speeds of about 250 miles per hour. This is why (for example) if you burn your hand, your brain is able to quickly remove it from the heat source before the pain even fully registers. Brain cells work the same way as, say, the cells in your left pinky toe or your tongue. There is nothing “special” about brain cells—it’s the programming which allows humans to think, feel, and communicate. Just as a calculator can’t actually do math without programming and the external entry of numbers, the physical structure of your brain can’t do these things without a layer of sensory input and the context of past experiences and learnings. However, when the brain—an infinitely intricate computer which has evolved over millions of years to be able to program and re-program itself in real time—works its magic, the basic components of brain function are still electrical signals, and they can be observed and measured. Although the electrical impulses of mammalian brains were not observed until the late 1800s, you could say that EEG got its start in the 1700s. It was then that Italian biologist Luigi Galvani noticed a dissected frog’s legs appeared to come to life when electricity was applied to its muscles. He first theorized that electrical currents cause muscles to contract. Nearly a century later, English scientist Richard Caton used electrodes to record electrical signals in the brains of various animals, including cats and monkeys. Since his method required the brain to be exposed, he could not experiment on humans. Although his measuring device was rudimentary (not to mention painfully invasive) by today’s standards, he was the first to record differences in EEG signals which were associated with sleep, alertness, sedation, and death. In 1924, German psychiatrist Hans Berger became the first researcher to record a human EEG. His subject was a 17-year-old boy who already had a hole drilled in his skull in order to treat a suspected tumour. Following this experiment, he devised methods of recording the electrical signals without drilling holes in anyone’s head—he used non-invasive electrodes attached to his son’s scalp, and tried silver needles on himself. Berger’s work was either ignored or ridiculed by his peers until 1934, when a pair of British electrophysiologists confirmed his findings, and Berger became widely known as the father of EEG. EEG testing is used to diagnose and evaluate various neurological conditions, such as epilepsy. The monitoring of a patient’s brain waves can give their doctor insight into any abnormalities in brain function. Other conditions which may be tested for using EEG include Alzheimer’s disease and narcolepsy. EEG is also used to monitor brain activity when a patient is in a coma. If the coma is natural and the patient is on complete life support, EEG can detect brain death. If a patient is in a medically induced coma, EEG is used to determine the appropriate amount of sedation needed to keep the patient in the coma. If extensive brain damage is suspected due to physical trauma, drug abuse, or any other factor, EEG testing can help determine the actual extent of the damage. EEG cannot measure the performance of the brain beyond its electrical activity, and cannot be used to determine intelligence or to diagnose most mental health conditions (with the exception of certain kinds of psychoses which affect electrical activity in the brain). Modern EEG tests, unlike the invasive procedures of the 18th and 19th centuries, are completely painless and safe. No electricity is actually administered to the patient—it is simply measured. EEG technology enables research in a variety of fields, from medicine to marketing. Recent research into sports-related concussions has used EEG testing to determine the short- and long-term results of sustaining multiple concussions or other head traumas. EEG has also played an important role in recent sleep studies, helping researchers learn the true effects of various lengths and qualities of sleep on the human brain. EEG testing is also being used in advertising. Researchers who observe eye movement, facial expressions, and brain waves to determine the effectiveness of various pieces of media are pioneering a field called neuromarketing, which seeks to use biometrics to better the odds of advertising success in a world already oversaturated by media. These are just a few examples of new and growing fields of research enabled by EEG technology—the measuring of human engagement and brain activity has nearly universal applications. Controlling a prosthetic limb with your mind was the stuff of science fiction until 1999, when a collaboration between researchers at the MCP Hahnemann School of Medicine in Philadelphia and Duke University in Durham (North Carolina) reported that they were successful in getting rats to control a simple robot using the rats’ brain activity alone. The field of neuroprosthetics is young, but promising. 15 years later, a paraplegic wearing a robotic exoskeleton controlled by his own brain signals kicked off the 2014 World Cup in Brazil. In 2015, researchers from the University of Houston developed an algorithm which allowed an amputee to grasp objects using a robotic hand which he controlled with his own mind. Early research in the field of neuroprosthetics required more invasive methods of recording brain signals (much like the early work of Richard Caton and Hans Berger). However, the robotic hand at the University of Houston was enabled by EEG alone, signalling a drastic advancement in neuroprosthetic technology and a new hope for people living with loss of limbs or mobility. Most people are familiar with the story of theoretical physicist Stephen Hawking, who lost the ability to speak after gradually becoming paralyzed due to ALS. His speech deteriorated rapidly in the late 70s, at which point he required a translator of sorts to communicate clearly with others. In the 80s, a serious bout of pneumonia necessitated a tracheotomy, which rendered him completely unable to speak. Hawking used a computer program to help him speak for several years, which was fairly high-tech for the late 1980s and early 90s. 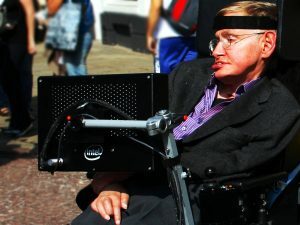 In 2005 he began using a program which allowed him to communicate via computer using only the movement of his cheek muscles, and in 2012 he began experimenting with brainwave-powered communication devices. A communication device powered by brain activity alone would restore speech to patients even with complete paralysis. The technology has yet to be perfected, but new research is promising, and may one day lead to perfect technology-enabled communication for patients with ALS and other degenerative illnesses. Learning about how someone’s brain works is an incredible educational tool. The education system suffers from a lack of resources and understanding, which hurts teachers’ ability to effectively instruct students who have learning disabilities or simply don’t learn well from conventional instruction methods. Some connections have been made between ADHD diagnoses and EEG readings showing dysregulated cortical electrical activity. 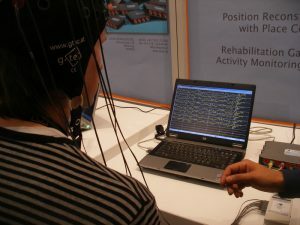 While diagnostics are not the responsibility of a teacher, applications of EEG technology which monitor focus and concentration could lead to a greater understanding of which educational techniques work best for individual students. Additionally, educational EEG-enabled games requiring intense focus could help unfocused students train their brains to concentrate better. What if you could play video games with your mind? It may not carry the scientific gravity of neuroprosthetics, but it sure is fun. Neurogaming (are you starting to get the hang of this naming convention?) is another new tech field—and definitely the most exciting growth area for the gaming industry—enabled by EEG. 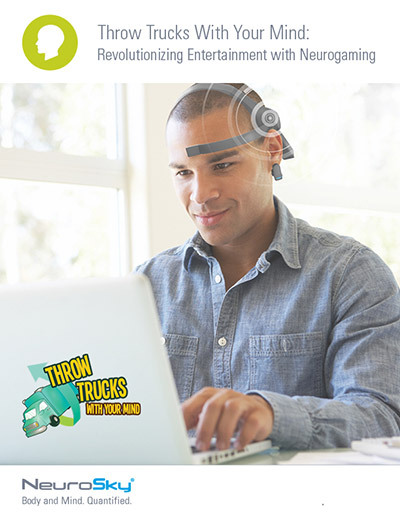 Game development company Crooked Tree Studios used NeuroSky’s EEG technology to build “Throw Trucks With Your Mind”, the objective of which is probably self-explanatory. Players focus their thoughts on a single object, and the NeuroSky MindWave Mobile 2 Headset interprets the electrical activity of their brains to pick up and hurl objects at opponents. Lat Ware, the creator of “Throw Trucks With Your Mind”, explains that the inspiration for the game came from his own experience with experimental neurofeedback therapy to treat his Attention Deficit Disorder. Learning that his brain activity could be fed into and interpreted by a computer fascinated Ware, eventually leading him to pitch his idea to Johnny Liu, the Director of NeuroSky’s Developer Program. Ware then raised nearly $50,000 via Kickstarter to get his project off the ground. The technology to support more applications of neurogaming exists but, until recently, it was too expensive to appeal to the average consumer of video games. Now that EEG headsets can be purchased for less than the cost of the newest traditional gaming console, neurogaming is poised to be the next big thing in video game entertainment. As more exciting developments are made with EEG applications and the cost of hardware decreases, the future of EEG for device manufacturers seems full of promise. Consumers increasingly turn to mobile apps and wearable devices (such as MyFitnessPal, Clue, MySugr, orthe LifeBeat™ fitness tracking wristband) to gain insight into their health and wellness metrics, and help them meet their personal health goals. As EEG data can be interpreted to measure biometrics such as focus, attention, mental fatigue, stress, and more, it presents a new opportunity to give consumers insight into their personal wellness metrics. As mentioned above, with personal EEG devices becoming affordable for the average consumer, the neurogaming applications are virtually endless. Augmented and virtual reality games which can be controlled with the mind may seem like science fiction, but are solidly within the reach of modern game developers. Combined with other biometrics such as heart rate, pupil dilation, and facial expression analysis, it seems anything is possible–if you can observe, measure, and interpret it, you can make a game of it. We’re passionate about the development of new EEG-enabled technologies—that’s why we engineer biosensors which are both affordable and easy to use. The MindWave Mobile 2 EEG Headset is accessible to startup game devs and advanced researchers alike, and provides data which is precise enough for either application (and any application in between). The MindWave Mobile 2 safely measures EEG power spectrums, NeuroSky eSense meters (mediation and attention), and eye blinks. 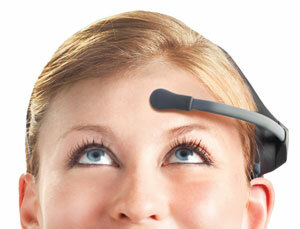 MindWave Mobile 2 physically consists of a headset, a sensor arm, and an ear clip. The headset’s reference and ground electrodes are located on the ear clip, and the EEG electrode is on the sensor arm where it rests on the forehead just above the eye (FP1 position). It is powered by a single AAA battery, which provides 8 hours of battery life. It also comes with free developer tools for top platforms. Click here to learn more about the resources available to you via the NeuroSky Developer Program. If you’re ready to break new ground in EEG research or tech development, we want to help you bring it to market. NeuroSky has integrated EEG solutions which will help you develop innovative products and bring them to market before the competition finishes learning the technology. To learn more about our integrated EEG biosensor solutions, including the MindWave Mobile 2 Headset, get in touch with one of our EEG experts today.